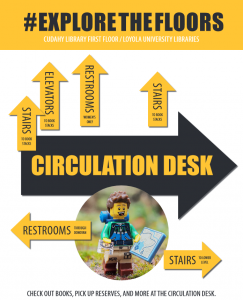 We’re here to help you #ExploreTheFloors of Cudahy Library! Maybe you’ve noticed some new signs in Cudahy, or maybe you haven’t been to visit us in a while because last time, you got lost. Over the next few weeks, we’ll be posting more about #ExploreTheFloors —what you can expect to find on every floor of Cudahy Library, where you can go to get help, and the study spots that’ll best fit your needs. On every floor, you’ll find a sign which explains what exactly is on that floor. For example, the second floor is home to the University Archives, and it also has the stacks which hold books with call numbers J through Z. In later posts, we’ll explain how to read a call number, what you can find at the circulation desk, and all sorts of other things. On the first floor, you’ll also find this handy sign with all sorts of arrows pointing all over the place. If you get to the first floor and think, “Okay, but this is a library. Where are all the books?”, go ahead and follow the arrows that read “elevators to book stacks” or “stairs to book stacks”! 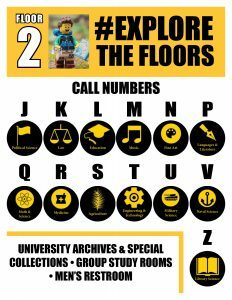 please join us as we #ExploreTheFloors! 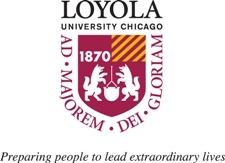 This entry was posted on August 31, 2018 at 9:10 am and is filed under News, Resources. You can follow any responses to this entry through the RSS 2.0 feed.